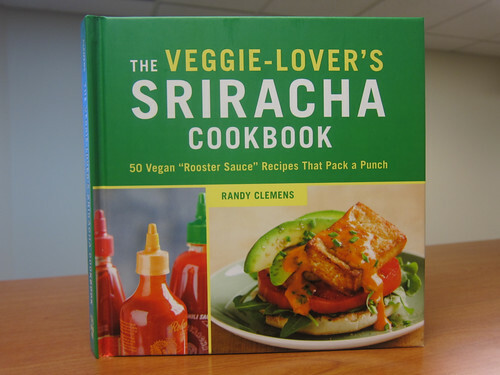 Tomorrow marks the launch of the follow-up to The Sriracha Cookbook: The Veggie-Lover’s Sriracha Cookbook. It’s actually likely nearer and dearer to the author’s heart since Randy Clemens himself is vegan. Whatever our diet, we can all partake in the cult that celebrates the, green cap-topped, garlic-vinegar-red jalapeño sauce that is Huy Fong Foods’ flagship, the famous “Rooster Sauce.” The launch event is free and both cookbooks will be available for purchase with Randy’s autograph – and everyone who does will receive a special edition of Sriracha sauce packaged in a limited edition bottle with “The Veggie-Lover’s Sriracha Cookbook — July 2, 2013” printed on it. Not only that, David Tran himself, founder of Huy Fong Foods will be attending the event, too. How fun will it be to be in the presence of Rooster Sauce royalty? All this will take place at the private event space that is Chloe’s inside The Pub at Golden Road Brewing. I love the space and you will, too. See you at the party! This entry was posted in Atwater Village, beer, Events, Food, Vegan, Vegetarian and tagged Atwater Village, beer, Chloe's, cookbook, David Tran, Golden Road Brewing, Huy Fong Foods, L.A., launch, menu, party mix, pub, Randy Clemens, recipes, sriracha, vegan, Vegetarian. Bookmark the permalink.